Starting as early as 2019, the Oakland Raiders may finally have a new city to call their own. After traipsing around California with 20+ year stints Oakland, Los Angeles and Oakland again, the Raiders could be headed to Las Vegas and, for the first time, be the only team in the marketplace. 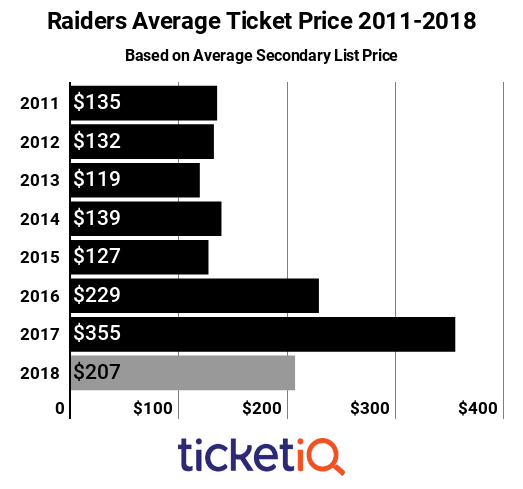 After reaching a decade high for ticket prices in 2017, demand for 2018 Oakland Raiders tickets isn’t nearly as strong, according to secondary ticket marketplace TicketIQ.com. But despite the drop, games on the 2018 Oakland Raiders schedule are the third most expensive since 2011 when TicketIQ.com began tracking data, and are the 17th most expensive in the NFL. 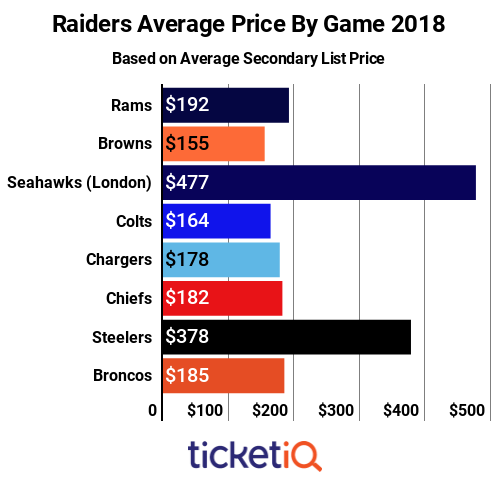 Between 2017 – when the NFL approved the Raiders move to Las Vegas and a year after making their first playoff appearance since 2002 – and 2018, the average asking price for tickets has fallen 42%, from $355 to $207. 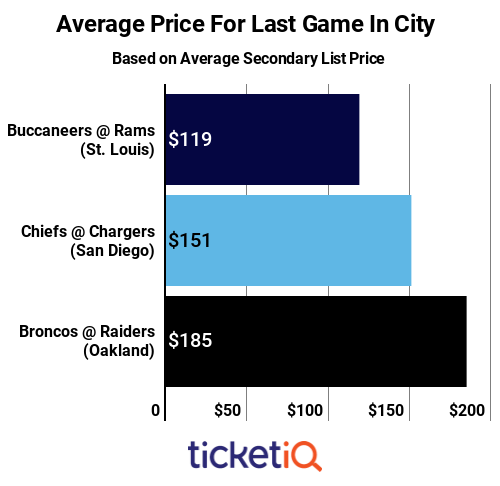 That ticket prices dropped before the Raiders potential last season in Oakland isn’t unusual. The Los Angeles Chargers, who moved from San Diego up the I-5 last season, saw a drop in prices from $213 in 2015 to $157 in 2016. On the flip side, the Los Angeles Rams, who spent two decades in St. Louis and won a Super Bowl there (1999), saw prices increase from $88 to $138 for the final season in 2015. Despite the overall price drop from last year, Raiders tickets will be tough to come by this season. Single-game tickets are available through Ticketmaster, the team’s primary market partner, but only in very limited quantities. As examples, there are fewer than a dozen seats available in multiple sections for the Pittsburgh Steelers game and some sections are already sold out for nearly every game. Season tickets are sold out for the third consecutive season, though fans can sign up for a priority waiting list with no money down. Those interested in season tickets if the team does move to Las Vegas, can get on a the list and pay $100 for a chance to buy a personal seat license. At Oakland-Alameda Coliseum, the single most expensive game this season will be the Raiders December 9 meeting with the Pittsburgh Steelers. The teams have a healthy rivalry that dates back to the 1972 “Immaculate Reception” game when the Steelers knocked the Raiders out of the playoffs. Since then, the Raiders have gone on to beat the Steelers in three of five post-season meetings, including twice on the way to Super Bowl victories (1976, 1983). Tickets for the game are all but sold out on the primary market, while the secondary market asking price is $378. By way of comparison, in Section 304, Row 5, behind the end zone, a single primary market seat is available for $250 while the seat next to it is $334 on the resale market. The next most expensive game of the season will be September 10 home opener against the Los Angeles Rams – one of two Monday Night Football appearances for the Raiders. The second will be Christmas Eve, when Oakland hosts AFC West rival Denver. For the Rams game, the average asking price for a ticket on the secondary market is $195. Oakland will play at home seven times during the regular season, as they’ll head to London for an October 14 game against Seattle. That game has the highest average asking price for a “home” game, at $477 on the secondary market and tickets are not available on the primary market. Fans looking for a chance to get into Oakland-Alameda Coliseum on the cheap should target the September 30 Cleveland Browns and October 28 Indianapolis Colts games. The cheapest primary market ticket for those games is $80 and $90, respectively. For all games, TicketIQ.com has seats available – both near the field and high above – that come with the company’s Low Price Guarantee. As examples, tickets are available for as little as $89 in the upper deck or $220 for a chance to sit in the legendary “Black Hole” section of the stadium.